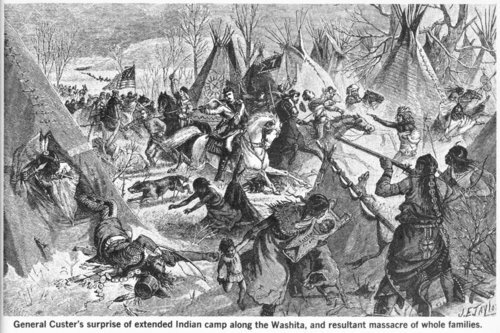 An illustration portraying General George Armstrong Custer's surprise attack on the Southern Cheyenne camp along the Washita River on November 27, 1868. This illustration was published in the July 1969 issue of Golden West Magazine - True Stories of the Old West, page 30. Funds for digitization provided by Mr. Steve Peckel in memory of William Chalfant.